There are few skincare products I truly like within a short period of trying them out. Usually, I’m just sceptical. 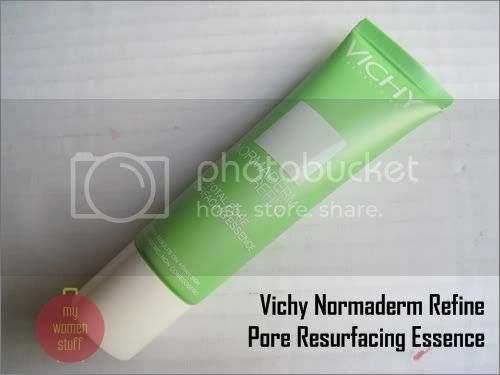 Unusually, the new Vichy Normaderm Pore Resurfacing Essence is an exception. 3 days into using it, and I was in love with it. After more than 2 weeks, its now a staple. A new addition to the Vichy Normaderm line, the Pore Resurfacing Essence is an essence you apply after cleanser and toner and before moisturizer to help refine your skin and make your skin look smoother with smaller pores. Used in the day, I apply it before moisturizer and sunscreen. Its a gel texture serum that spreads easily and mattifys the skin almost immediately. Lovely if you have oily skin or combination skin. I sometimes get a tad oily as the day wears on but with this essence, I’m relatively oil free and whatever foundation I use sticks better to my skin and looks and feels smoother. Reminds me a lot of Estee Lauder’s Idealist when I was using it a long while back. Another side benefit I’ve discovered is the wonderful ability for this Vichy Pore Resurfacing Essence to help combat pimples and spots. 2 days after using this essence day and night, some stubborn spots on my chin have all but disappeared. 2 weeks later there is no sign I ever had spots! I hardly noticed it until I wanted to dab concealer on them and realised there was no need to. If I have a particularly stubborn spot, I dab some Vichy Refine essence on the spot and wake up the next day to trouble-free skin. I attribute it to the salicylic acid – the same magic ingredient in the aspirin mask and the St. Ives Medicated Scrub. Only because this stays on your skin, it seems to work better for me. Does the Essence make pores smaller? I don’t have very large open pores and it is supposed to take 4 weeks to see any results so I can’t quite say with great certainty that it made pores look smaller. My skin is looking a fair bit smoother though after more than 2 weeks. Upon application, my skin looks and feels very smooth and pores do look a little smaller. Whether it stays that way remains to be seen. I reckon this essence would be good for those with oily skins – its certainly targeted at oily skins. Where did I have dinner yesterday? I myself can barely believe it but I went down to Seremban yesterday evening after work with Beetrice for dinner! The lengths food lovers will go for some seriously good food! Tonight I’m going for ice-cream mmm…. oooh! this looks nice! oil control products are always good for me! I cannot find this on Vichy website. where can I get this product. I bought mine in Singapore at the Pharmacy store but is not able to find it now. ooh great review..I bought the Vichy starter kit and have yet to try it out yet. But I am definitely checking this out. Love the fact that it has salicylic acid and doubles as a primer too. You know, I’ve never tried Vichy before this but now I want to try the other products! This ones awesome. Wah! Do share on where you can get Vichy at a cheaper price. I reckon that this one is not part of the range that is available in Watsons? Sasa tends to be pricey. LYN? but I haven’t seen a Vichy spree in a while. I have this conspicuous pore at the end of my nose and the parts of my cheeks closest to my nose. Heh.. I meant I’ve seen it go for slightly under RM110 if Vichy has a sale or promo prices. You can get this one at any Guardian or Watsons store that stocks Vichy products. Fantastic Review, like always Paris, you know i think those people should start paying you cos most of the things you’ve reviewed I want to buy now hehe!!! I’ve tried a few Vichy Normaderm products but not this one. I’m currently using Estee Lauder’s Idealist. Will try this one when I finish the Estee Lauder’s Idealist I’m currently using. Vichy products never really work on me, I don’t know why. This one’s new here but I’m not sure about elsewhere. I’d never tried Vichy products before because I used to think they were for acne prone skin. This one works to keep my spots away but others I’ve tried are a little more drying. Maybe thats why it doesn’t work? I finished up my Body Shop Skin Boost a while ago so I’m not using it anymore. I reckon the Vichy and Body Shop gives different effects. The Vichy one smooths pores and skin while the Body Shop one adds radiance. To me anyway. I dont’ think they play well together though since they both contain silicones so they may cancel each other out. But since the Vichy is permanent you could try it once your Body Shop Skin Boost is finished? Thanks for recommending this – I was finishing up on my Cellnique Pro Sebum Gel and wondering if I should try other brands. The pro sebum gel did help reducing spots on my forehead but I’m looking for something that can control pores as well – without burning a big hole in my pocket. care to share with me which moisturiser and sunblock u use along with this Vichy Essence? also, u mentioned that u use it as a makeup primer too – do u layer on powder foundation or liquid foundation? Which works better? I use my regular moisturizer and sunblock – anything I have on hand, nothing special. I find it works a little better with powder foundation and I don’t use it specifically as makeup primer, but since its already on my skin it acts that way. Vichy should be cheaper in Singapore! where can i get it in klang valley malaysia?